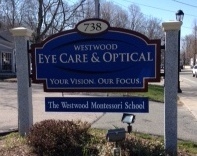 Welcome to Westwood Eye Care & Optical where your vision and eye health are our primary concern. Since 1984, guided by Dr. Wayne Zahka, we have long been recognized as leaders in patient care. We offer the highest standards of quality and individualized attention in a relaxed, professional atmosphere. Providing you with the best value for eye care, eyewear, contact lenses and laser vision correction. Visit our Optical Boutique where we use only the highest quality digital and individual lenses and the latest in fashionable eyewear: Tory Burch, Zac Posen, Ray-Ban, Fendi, Jimmy Choo, Maui Jim, Gucci, Kate Spade, Oakley, Joseph Abboud to name a few. Our experienced opticians are fully licensed and can help you find and fit the perfect frame to match your fashion, lifestyle and budget. Give us a call to set up an appointment for a comprehensive eye exam. We hope to see you soon!